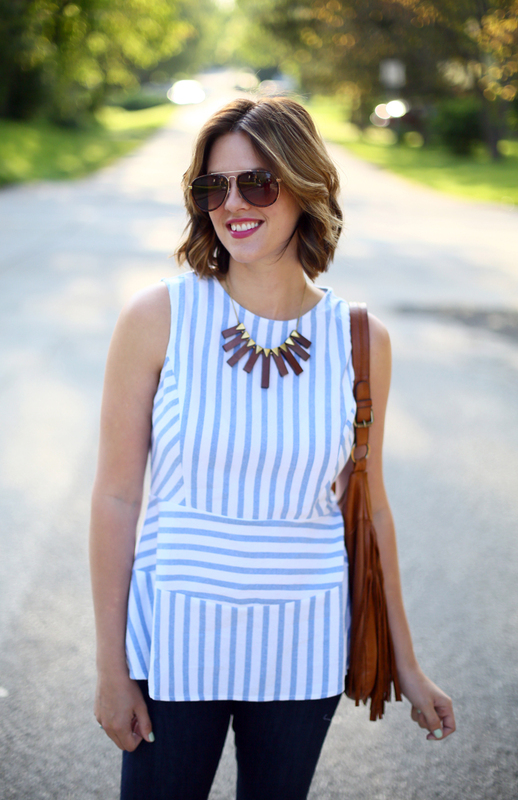 WhatIWore: I haven’t worn this dress in a quite a while – I’m not sure if I’ve ever even taken photos of it before! 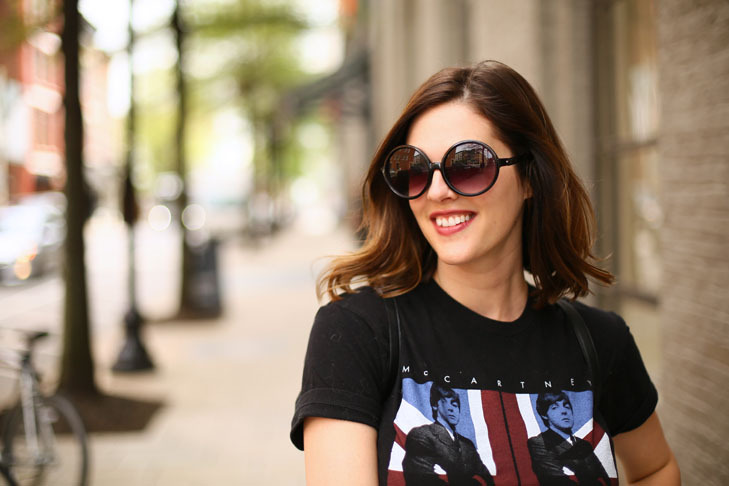 I got it out when I was digging through my maternity clothes because… I’m pregnant! I thought I’d do some big post to announce but I haven’t really had a bump until this morning! It’s kind of weird how it works in the early days. Flat one morning and then… baby belly the next! Needless to say, we are thrilled about this pregnancy and adding to our family. The early days were so rough on me. Much more difficult than my pregnancy with Felix. My immune system is really down so I’ve been getting sick with other things on top of the morning sickness, which some of you have probably guessed by my lack of summertime posts! But feeling great today and very excited to go public with our pregnancy. It’s so strange to keep such a big secret for so long! We’ll meet baby Q number two in the new year. Maybe even a New Year’s baby! First baby of 2017?! Who knows! We will also find out the gender of the baby this time around in a few weeks. Excited about that too – either a baby girl which would be awesome or a little brother for Felix – equally wonderful! I have a gut feeling, but you never know! 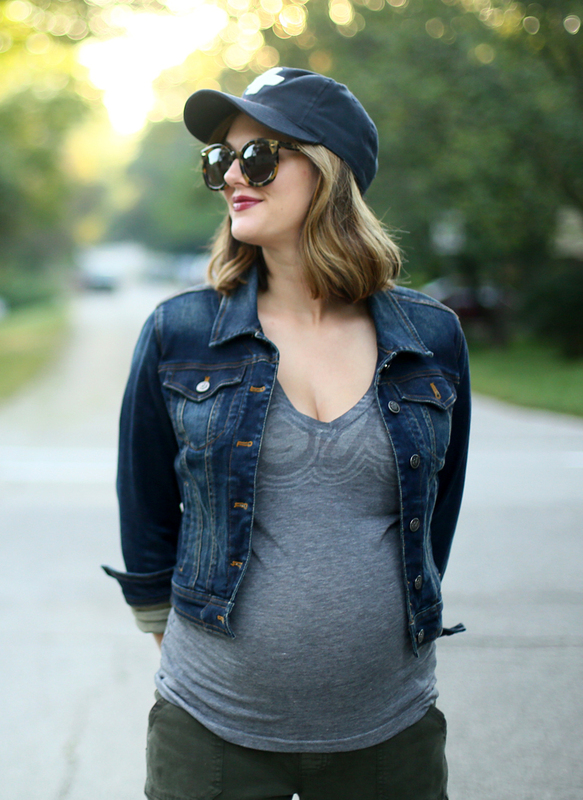 As for maternity clothes, I’m so excited to be pregnant for the fall and winter, so I think I’ll have a better attitude about getting dressed (see my summer maternity outfits here). I think I can still get use of our some of my regular clothes for a while too, plus I have all of my boots and jackets to look forward to wearing. 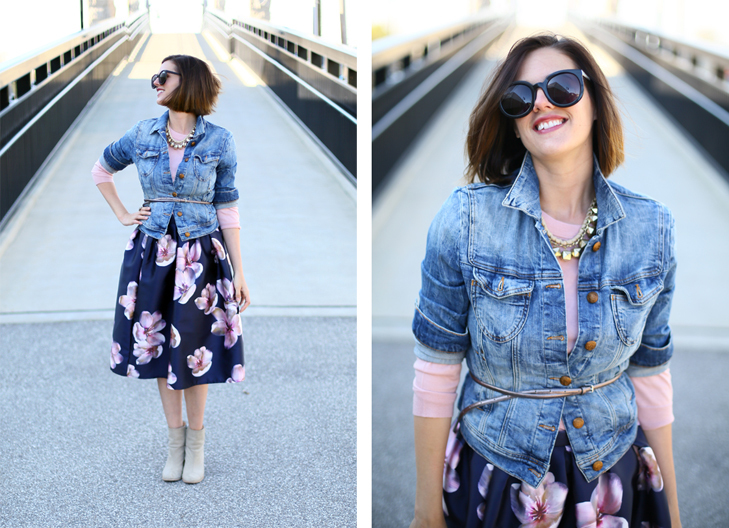 WhatIWore: Good morning! I hope you had a nice weekend, spending time with your loved ones! Not every American was so lucky after the recent wave of violence and tragedy. I wrote a post about it yesterday and I’d like for you to take the time to read it. We must take action! It feels a little strange to switch gears and post outfit photos, but as many of you reminded me a few weeks ago, it’s good to go on with our daily lives as we cope with the sadness and anger so many of use are feeling. It’s been a while since I’ve done my hair or worn makeup. I felt really comfortable with a bare face and air dried hair over the past few weeks, but I also felt really pretty this morning after I got ready! I thought a skirt would be a nice contrast to the jean shorts I’ve worn for days on end. This is the sort of thing I’d wear if I worked an office job – it’s pulled together but still has a cool, summery feeling. 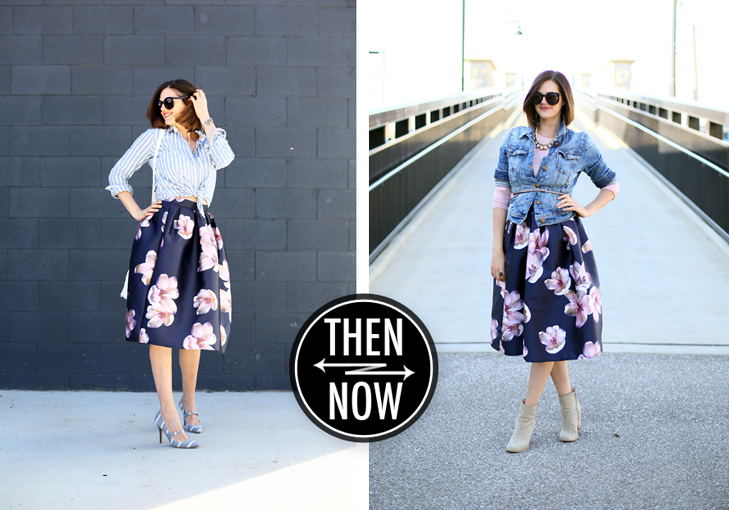 See Also: More ways I’ve worn this navy lace pencil skirt… it’s surprisingly versatile! 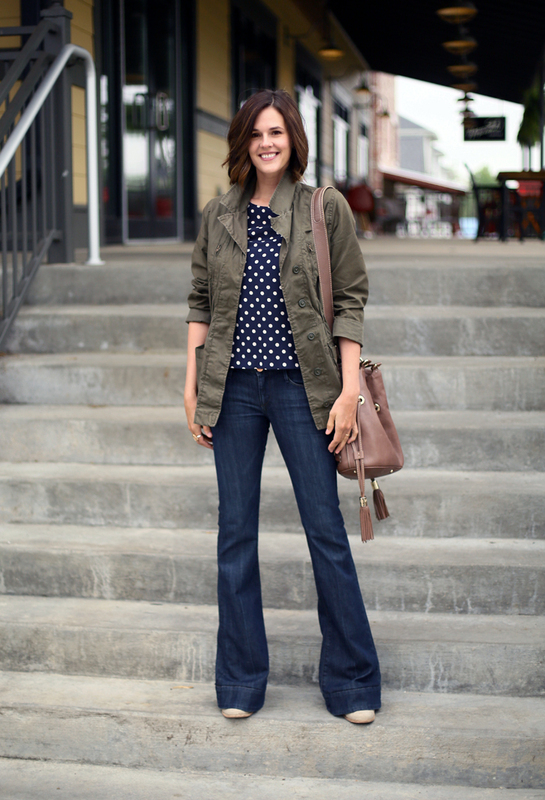 A tee shirt, an army jacket, a white blouse or a tied chambray shirt! 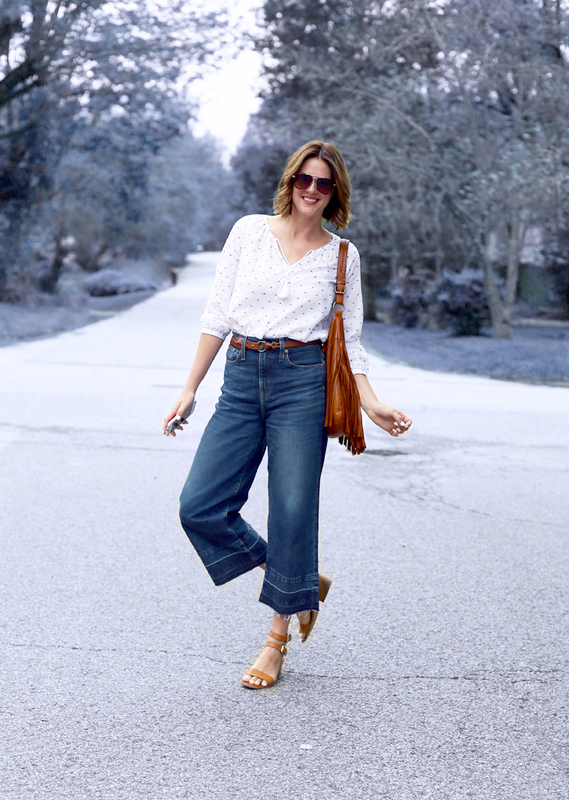 WhatIWore: Do these jeans look familiar? 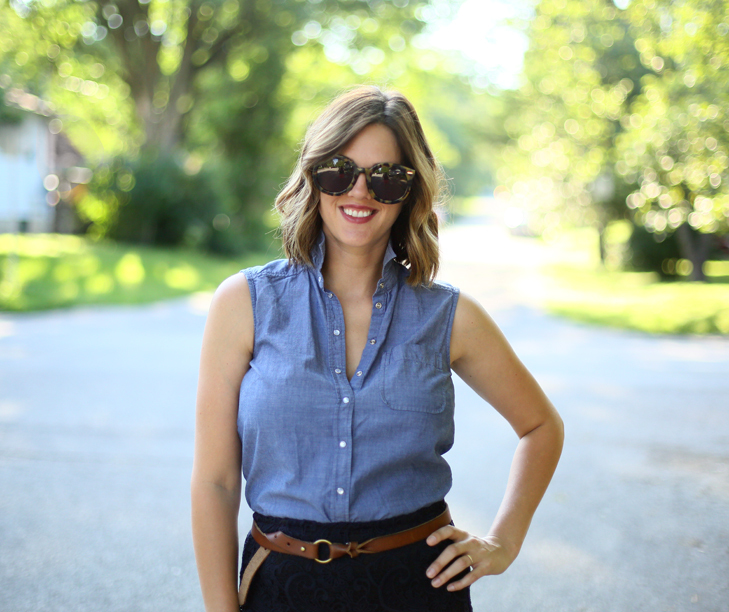 They’re the other pair of Point Sur denim that I was debating on getting (and asked your advice on!) They went on sale and I had a bit of play money for the month, so I got ‘em. I’m so glad I did! I love how different they are from what’s in my current closet. Sometimes a fresh silhouette can really spark inspiration for me. And not like Jessica-as-70s-mommy is a new look for me, but I usually feel more bohemian in with my fall wardrobe versus spring. My top is also new and it’s from Target. For reference I sized down to an extra small because although I like flowy tops these days, I don’t want to be swimming in them. The belt is Target too! In addition to all of the jeans I’ve been wearing lately, I’m really into variations on a white shirt. I made that eyelet one, there’s my creamish colored eyelet from a few years ago, and I have a few others in line to be worn. 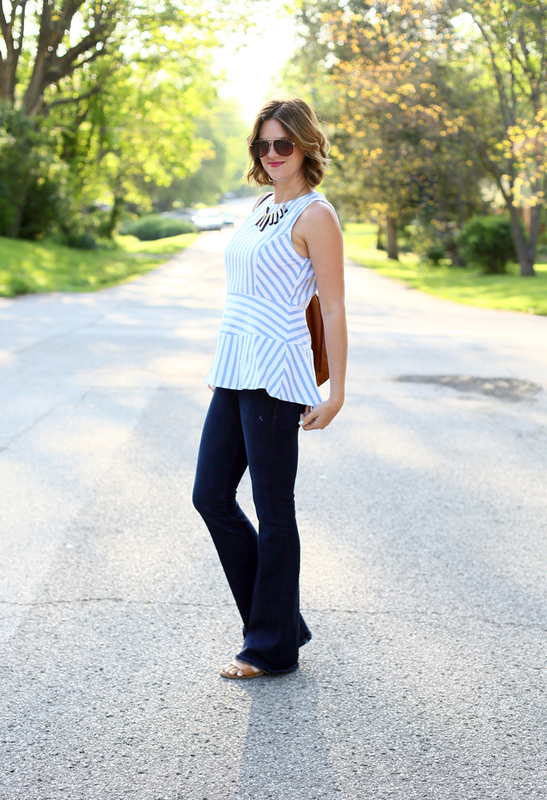 WhatIWore: Greetings! I feel like it’s been a while since I’ve sat down to edit and write about an outfit post – both of the photo sets this week were taken over the weekend. We’ve been slammed with some intense allergies – the worst of my life (and I’m normally not an allergy sufferer!!!) We initially thought we had really bad colds, but the word about town is that the pollen counts are so high a lot of people think they have strep throat when it’s just whatever’s in the air. So needless to say, we’ve been staying in, on the couch, co-sleeping again and trying to get back on our feet. It’s been one of those weeks! Well, maybe you can…Goodwill! I used to be a big thrift/second hand shopper and it was always a great way to get inspired with pieces that not everyone has (plus easy on the wallet too!) And I KNOW no one else will have this skirt because it’s handmade. It really reminded me of this outfit (which I no longer have, sad face) so for $4.29, it was all mine! 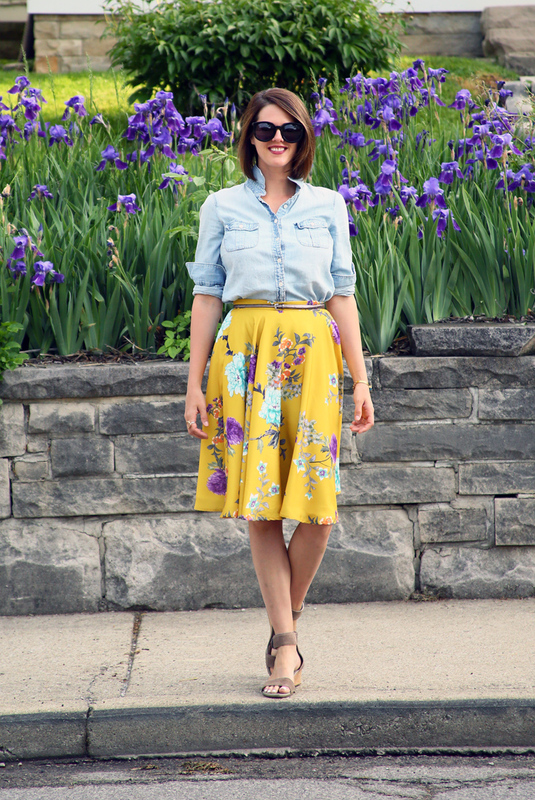 WhatIWore: Of all the pretty pattern mixing a gal (or guy!) 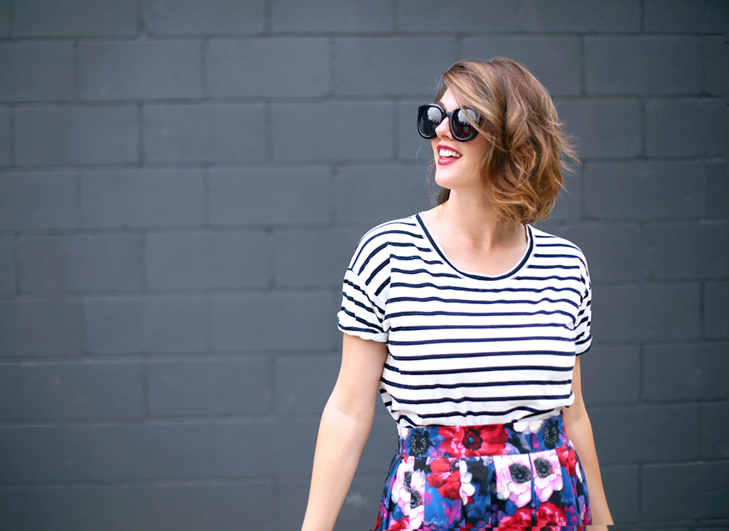 can do these days, stripes and floral are probably my favorite. A two colored stripe can work with so many different kinds of prints, but I’m a sucker for flowers. I like the way this combo came together, although I think I need to alter the skirt to fit a little better. 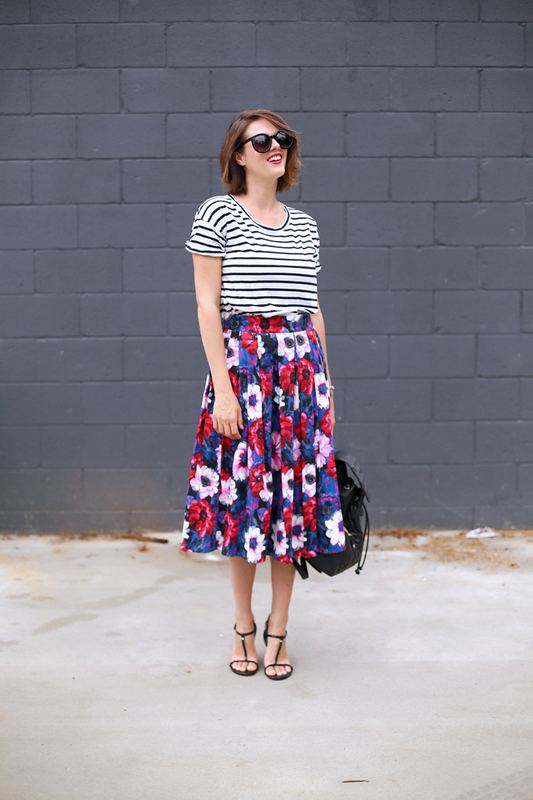 How do you rock pattern mixing most? 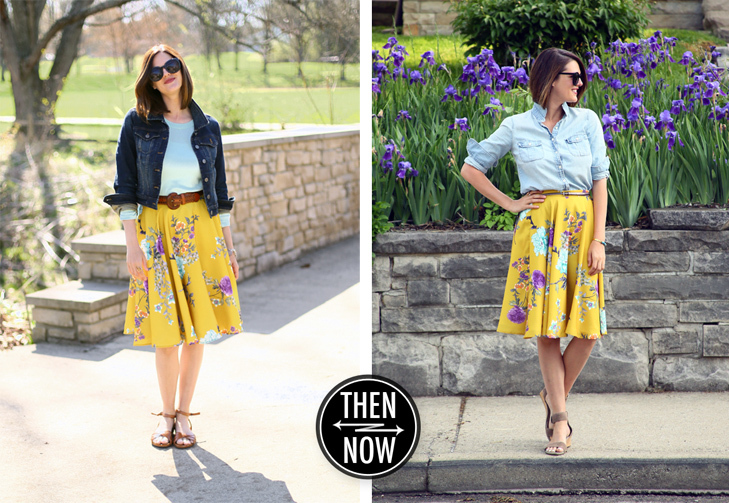 See Also: How I’ve styled this skirt and tee (one and two) before. 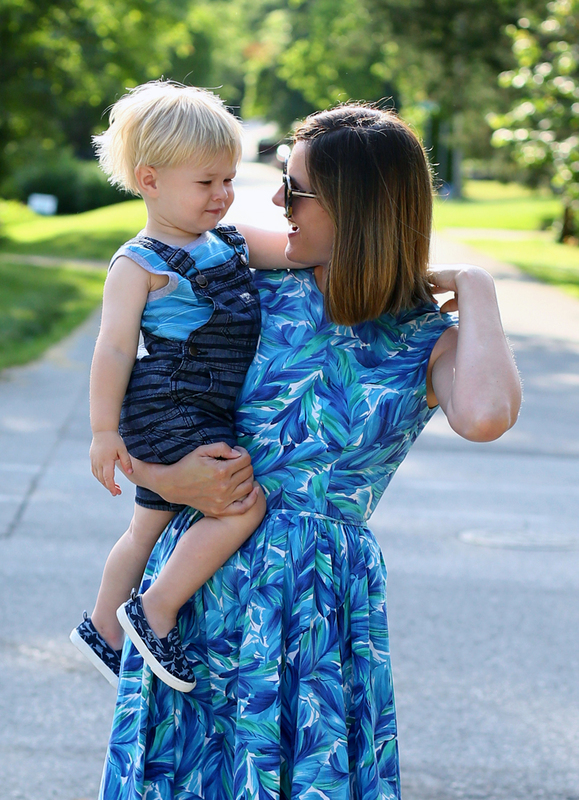 WhatIWore: The weather in Southern Indiana has been beautiful this week, and we’ve been spending a lot of time outside to enjoy it. Lately that means starting the day walking Adam to work. It’s a fun routine and forces me and Felix to get ready for the day instead of lounging around in jammies until noon the whole day like we did during the winter. I’m still loving this skirt and playing around with different ways to wear it. I’ll probably do a white tank top and hat the next time around, but I’d love some of your ideas on what could work too. Help me out on facebook! 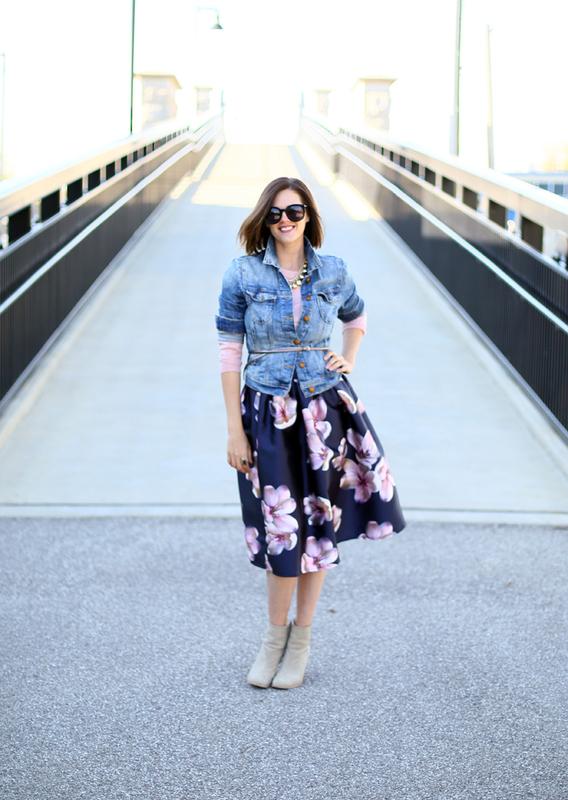 WhatIWore: Surprise! Surprise! 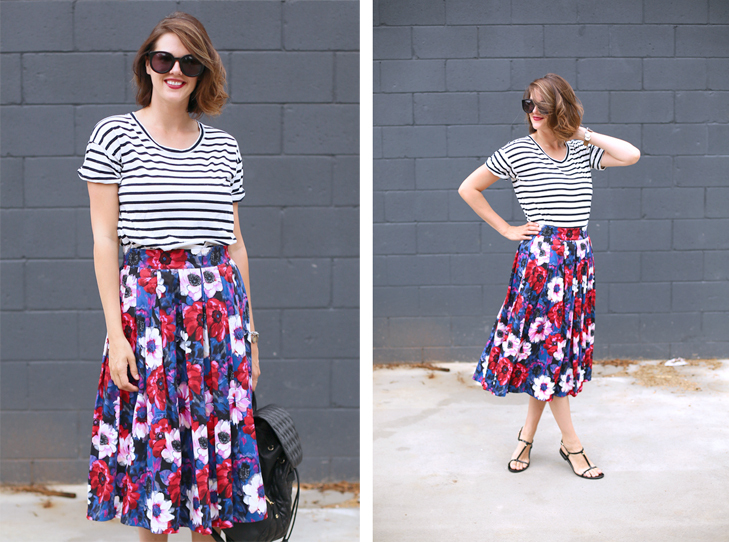 I’m in another full floral print skirt! This version is a sateen fabric, so it could be on the dressy side, which is why I partnered it with my favorite beat up denim jacket. I toyed with the idea of doing a graphic tee underneath but liked the simplicity of a soft three quarter length sweater instead. Because it was on the chilly side, I opted for booties over sandals or heels. Monday also marked the final day of my fashion illustration class that I taught at Indiana University. It’s always amazing for me to see how my students grow through the course and how beautiful their final portfolios turn out. I learned a few things from the class too. First – I need to find more time to do creative projects, including illustrations. I miss drawing! Two – I need to keep signing up for classes on my own. Not full semesters, but weekend conferences or hat making classes or cooking classes. I get so inspired in a classroom setting, whether it’s as the student or instructor! 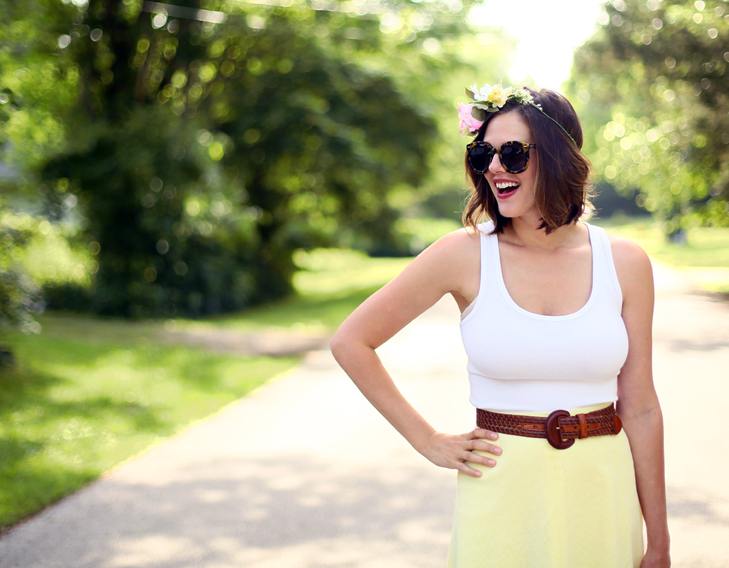 WhatIWore: We had such a great weekend! Adam took a few days off and on Friday we drove south to Louisville for the day. 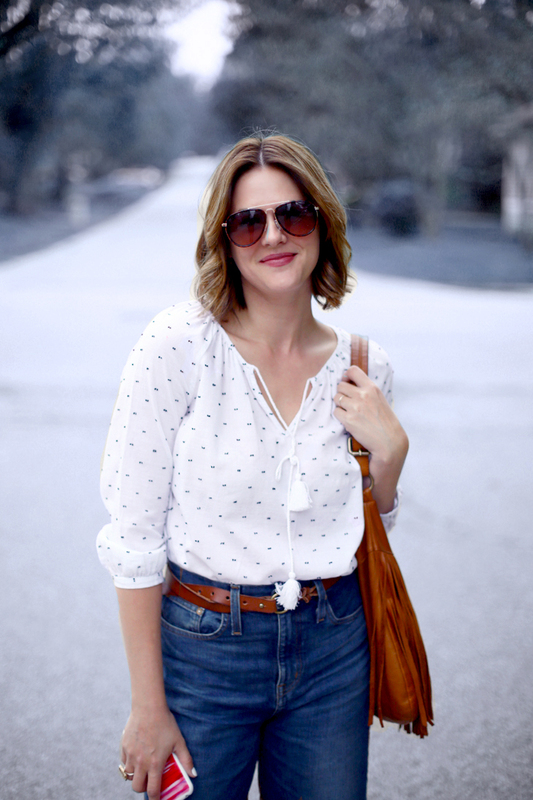 I knew the weather would be nice, and I wanted to wear this polka dot skirt but wasn’t sure what top to pair with it. 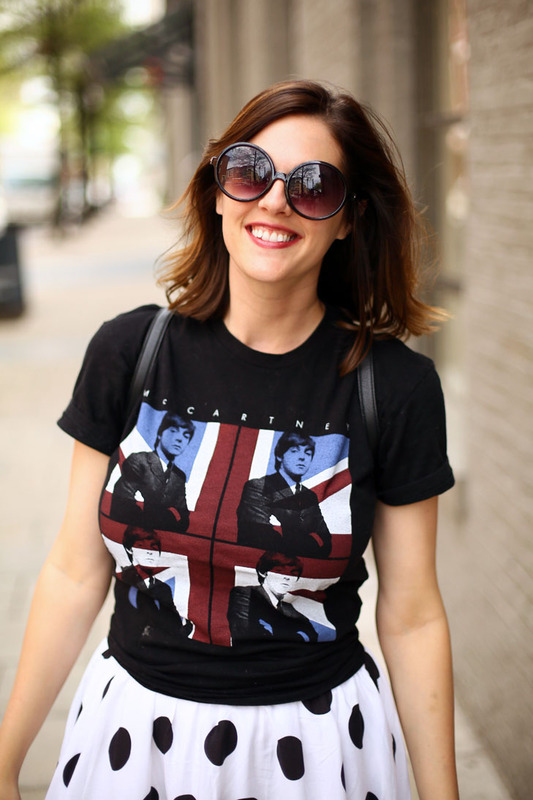 I thought a black tee could be cute and then I had the idea to wear a Paul McCartney tee I bought when we saw him in concert with Adam’s parents a few years ago. I love how it works together. Sort of weird but cute too! 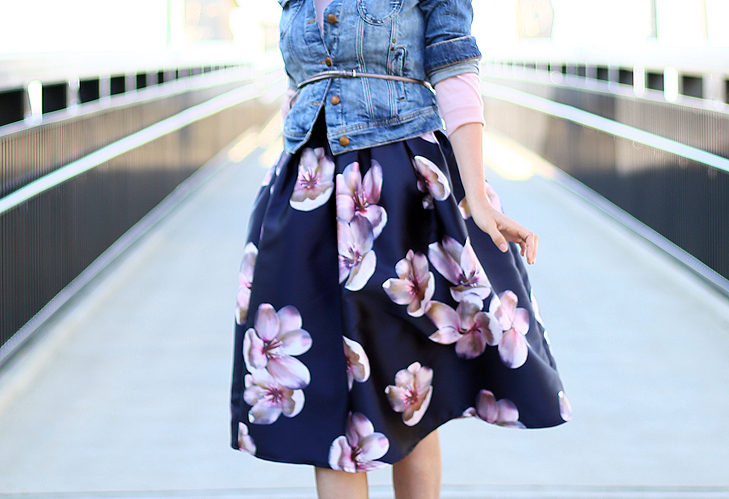 I kept my shoes simple (flat sandals) and also had a jean jacket for the cooler morning hours.